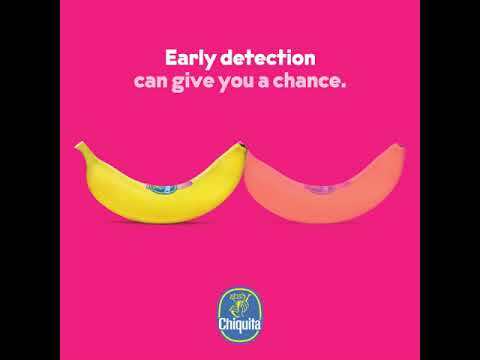 Chiquita is communicating again with "Pink About It", their new campaign which aims to raise awareness and sensitise public opinion on the topic of breast cancer research and prevention. October is the month for prevention: traditional treatments are currently making enormous progress, but early diagnosis remains the best tool to make the treatment as effective as possible. 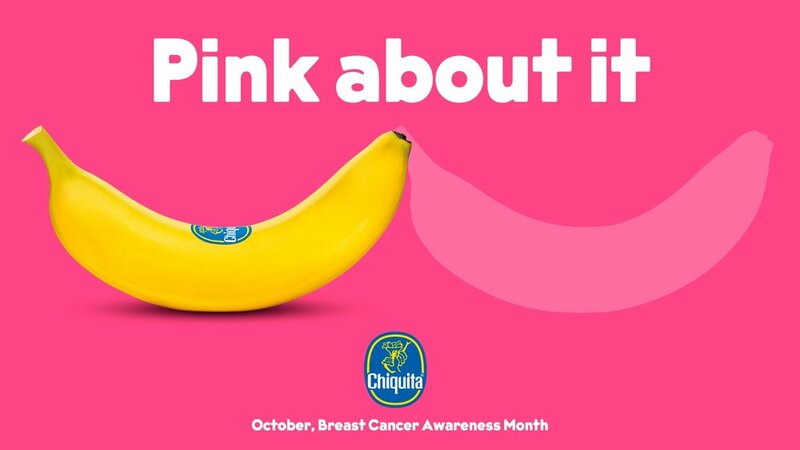 Chiquita has demonstrated its strong social responsibility and pays particular attention to health issues: indeed, for a number of years it has produced a special edition of its iconic Blue Sticker, replacing it with the now famous "Pink Sticker" during Breast Cancer Awareness Month. The brand has now added a CSR campaign to this operation. The aim is to provide information and be involving thanks to the use of pop language, but also to make the target reflect. The Armando Testa digital unit has chosen a visual synthesis full of impact: two bananas side by side bring to mind a woman’s cleavage. One of the two disappears leaving an empty space, then the copy outlines the campaign insight: early diagnosis can give hope, which should not be allowed to disappear. The campaign is integrated and cross-media, and is part of a communication environment that includes several touchpoints, both online and offline. Development both on DOOH totems with 10 "and 20" video cuts and in the digital world. The Armando Testa social team has created a series of ad hoc contents for Facebook and Instagram, integrated into the special "Pink" editorial plan created for the month of October. Media planning by Local Planet, the global media network of independent agencies of which Media Italia (Armando Testa Group) is one of the founding partners. ARMANDO TESTA BY THE SIDE OF FAI AGAIN TO OPEN DOORS TO THE UNBELIEVABLE. On the occasion of the 27th edition of the FAI Spring Days, Armando Testa and FAI - Fondo Ambiente Italiano are once again working together. FOLLOW YOUR DREAMS ALWAYS, THE NEW PAN DI STELLE SUBJECT WITH ARMANDO TESTA. The second subject of the new Pan di Stelle campaign "Follow your dreams always" by Armando Testa makes its on air debut from March 10th. On the occasion of the launch of Sustenium Bioritmo 3 Multivitaminico, Menarini is introducing a new communication format created by Armando Testa. TA TA TA TA ... LINES AND ARMANDO TESTA ANNOUNCE THE UNION OF DRY AND COTTON! The bumper multi-subject launch campaign for new Lines Cotone created by Armando Testa is airing on main TV networks from Sunday 17 February with follow-up on the web and social media, Instagram Stories and post Facebook. ALWAYS FOLLOW YOUR DREAMS THE NEW PAN DI STELLE CAMPAIGN COMES TO LIFE WITH ARMANDO TESTA. The campaign, created by Armando Testa, which has been managing the communication of the brand for years, starts with the first of the two subjects on Sunday 10 February on the main channels and on the web.